Blombos Cave: K-12 TLC Guide. Cueva De Villa Luz - Cave of the Lighted Town: K-12 TLC Guide. Fountain Cave: K-12 TLC Guide. Indiana Caves: K-12 TLC Guide. Kartchner Caverns, AZ: K-12 TLC Guide. Lascaux Cave: K-12 TLC Guide. Oregon Caves National Monument: K-12 TLC Guide. Pech-Merle Cave: K-12 TLC Guide. Russell Cave National Monument: K-12 TLC Guide. Son Doong Cave: K-12 TLC Guide. Southeast United States Landforms: K-12 TLC Guide. Texas Caves: K-12 TLC Guide. Chinese Cave Dwellers of 21st-Century. The Cave of Lascaux, France. Caves in Idaho, Idaho Museum of Natural History. 09/12/1940: Lascaux Caves Discovered in France. The Kid's Page, Bridal Cave and Thunder Mountain Park. Adversities and Threats to Cave and Karst Systems. Children's Books About Caves and Bats. General Books About Caves and Bats. Importance of Cave and Karst Systems. Importance of Caves and Karst. National Parks with Caves and Karst. Threats to Caves and Karst. What and Who are in Caves? Into the Lost Crystal Caves. A 'Blind Descent' into the Deepest Caves on Earth. Scientists Find 5,500-Year-Old Preserved Shoe in Cave. The Mysterious Life of Caves. NOVA: Secrets of the Crocodile Caves. Search for New Life Takes Two Women to New Depths, Space.com. Fate of the Cave Bear. Texas Caves Webcast, Texas Parks and Wildlife. Highland Park Elementary School, TX. Idaho Museum of Natural History. Apostle Islands National Lakeshore: Sea Caves. 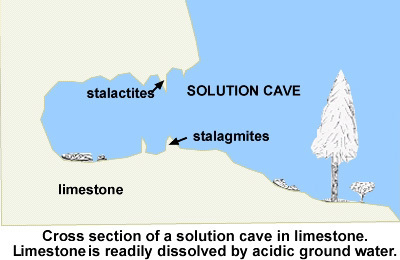 Limestone Caves: K-12 TLC Guide. The Geology of Solution Caves, The Philadelphia Grotto. 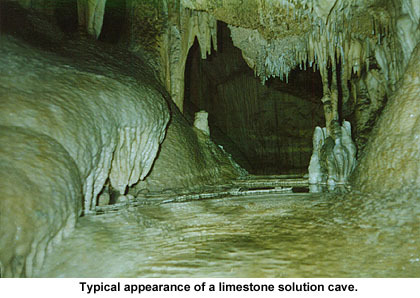 The Inside of a Limestone Solution Cave. Limestone Cave Ecosystems, Riverina Envronmental Education Centre. Bungonia State Conservation Area, The Southern Tablelands. Caves of South Dakota, Northern State University. Chillagoe Limestone Karst Area, Australia. Luray Caverns: K-12 TLC Guide. Wind Cave Exploration and Resource Management. Solution Caves: K-12 TLC Guide. How Are Caves Formed?, ThinkQuest. International Union of Pure and Applied Chemistry. Missouri Department of Natural Resources. Upper Cumberland Grotto Home Cave. The World's Largest Cave Formations, The Virtual Cave. Bridal Cave and Thunder Mountain Park. Illinois Department of Natural Resources. What and Who are in Caves?, National Park Service. Blind Pseudoscorpion: K-12 TLC Guide. Ozark Blind Salamander: K-12 TLC Guide. Blind Cave Fish: K-12 TLC Guide. Blind Crayfish: K-12 TLC Guide. Caves, South Central Service Cooperative. Making a Solution Cave, Idaho Museum of Natural History. Without Light There is No Life. Penn's Cave Teacher's Guide (pdf), Penn's Cave: All-Water Cavern and Wildlife Park. Caves in the United States. Visit the Paleolithic Cave at Lascaux. Teacher's Guide to Caves, National Park Service.